It's no secret that one of my "things" in relation to my blog is to get up close and personal with chefs. 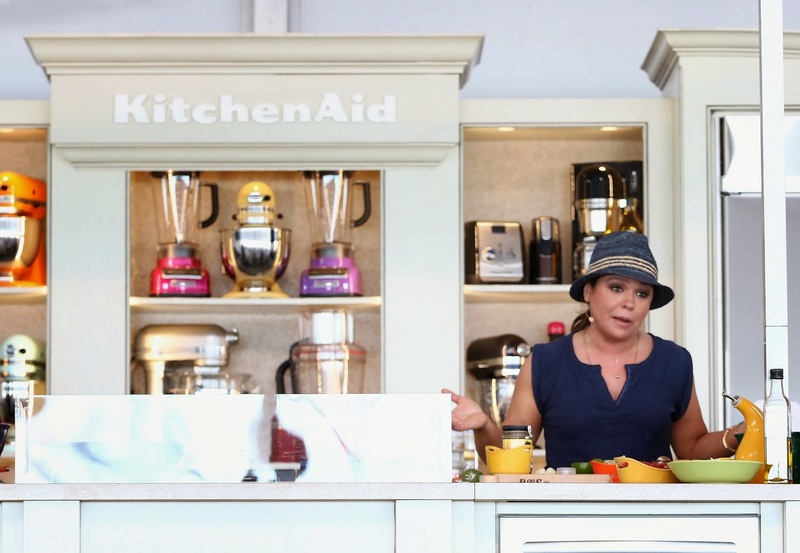 So while at #SobeWFF, it was my mission to attend a bunch of culinary demonstrations on the KitchenAid stage where I would have a chance to interacts with the celebrity chefs. As a home cook, by doing this, I always walk away loaded with a bunch of knowledge and cooking pointers that I would have never of learned else wise. I promise it will help you recreate the dishes you see demonstrated. One of my favorite demos I attended was with Rachael Ray. I adore her #girlpower! She is a huge advocate of animal rescue; she is bubbly, sweet and lights up every room she walks into. She is my soul sister and I was lucky to chat it up with her that weekend! I will be sharing the recipe for her chicken suiza tacos. It is super easy and fun to make, and the a video can be seen here on how to make it The Rachael Ray Show. Quick pickled red onions: very thinly sliced 1 red onion, combined with 1 thinly sliced jalapeño, juice of 1 lime, salt and pepper. Let stand 20 minutes. For the chicken, whisk up marinade in shallow dish, add meat and season with salt and pepper. Turn chicken to coat and marinate half an hour. Heat a large, cast-iron or heavy skillet over medium-high. Add chicken, cook 8-10 minutes, turning occasionally, under loose foil then remove to a cutting board. Add stock to pan to loosen drippings, slice chicken and return. While chicken is still marinating, for peppers, heat broiler and leaving door ajar for steam to escape, char peppers and tomatillo until skins are blackened. Cool in covered bowl then peel most of skin from peppers and slice. Finely chop or puree tomatillos (about ½ cup), reserve. Heat skillet over medium heat with 1 turn of the pan of oil, add onions and garlic, cumin, oregano, stir 2-3 minutes, add crema or crème or cream and reduce to thicken a minute or 2, stir in peppers, tomatillo puree, salt, pepper, lime juice, honey, reduce heat to low or cover pan to keep warm. Serve slice chicken with poblanos in crema, fill tortillas and top with cheeses, lettuce, radishes, pickled onions and cilantro or parsley. Enjoy! The descriptive and predictive design a tshirt adequacy cute couple shirts of theories of decision making under uncertainty/ambiguityHey, J. D., Lotito, G. Maffioletti, A., Oct 2010Article in Journal of Risk and UncertaintyPublication detailsJournalJournal of Risk and UncertaintyDateAccepted/In press 9 Dec solar eclipse shirts 2016DateE pub ahead of print (current) 12 Jun 2017Number of pages19Pages (from to)1 19Early online date12/06/17Original languageEnglishAbstractThis paper is about behaviour under ambiguity that is, a situation in which probabilities either do not exist or are not known.